Between choosing a qualified birth team, getting that spare room ready, and the baby shower, it’s easy to forget about something we all take for granted: our posture. Proper posture and movement are essential for everyone, but it’s far more important for mothers-to-be. Are you sleeping in the best position to sleep while pregnant? Are you sitting in the best position during your pregnancy? These little changes can have an impact on the health of you and your baby. From when you first get the great news to the day you’re ready to give birth, here are the best postures and activity suggestions to ensure a healthy pregnancy and delivery. Sleeping on your left side will allow the most nutrients to flow to your placenta for the baby and potentially relieve some of the pressure of your growing baby off your inferior vena cava which in theory may improve circulation. If you are uncomfortable it is OK to switch sides during the night – just try to spend most of your time on your left side remembering that ultimately the most important thing is you are getting some much needed sleep. We recommend leaning your shoulder backward to relieve pressure from your shoulder and then place a pillow behind you so that you don’t end up sleeping on your back. Can You Sleep on Your Back While Pregnant? While it might be appropriate for the first trimester, you want to avoid sleeping on your back after this point. It can become problematic for you and the baby as proper blood flow, and nutrient delivery to the baby can be compromised. If you get dizzy lying on your back, that could be because you are putting pressure on your vena cava and you should turn to your side. First, if your baby is in an occipito-posterior position (head down towards the pelvis but facing towards your abdomen), you can try these positions before settling into sleep. Lay so that baby’s back is toward the bed for 15 to 30 minutes, then change to kneeling and leaning forward for another 15 to 30 minutes. This will help create room for your baby to move around in and get into an optimal position for birth. Yes, we recommend them for support, but any pillows or blankets that provide support will do. Proper posture starts with how you stand and walk. From top to bottom: Maintain a neutral gaze that looks straight ahead. Don’t bend your head too much forward or backward. Your chest should be up, core braced, and your shoulders back; in other words, a classic power posture. One easy trick to keep in mind to help you maintain a strong standing stance: imagine you’re being pulled by a string from the top of your head. When you’re in a position where you have to hold in one place for an extended period like washing dishes, be sure to prop up your foot on a box, stool, or counter. In the case of washing dishes, you can open the cabinet under the sink and rest one foot on the ledge. Switch this position every 20 to 30 minutes. Walking is one of the best ways to safely exercise during your pregnancy so it’ll be essential to maintain the classic power posture mentioned above as you walk. When you’re pregnant, you’ll feel your center of gravity shift forward. Fight the urge to hunch your shoulders and shift your neck forward as this can result in postural distortions that cause discomfort and pain. 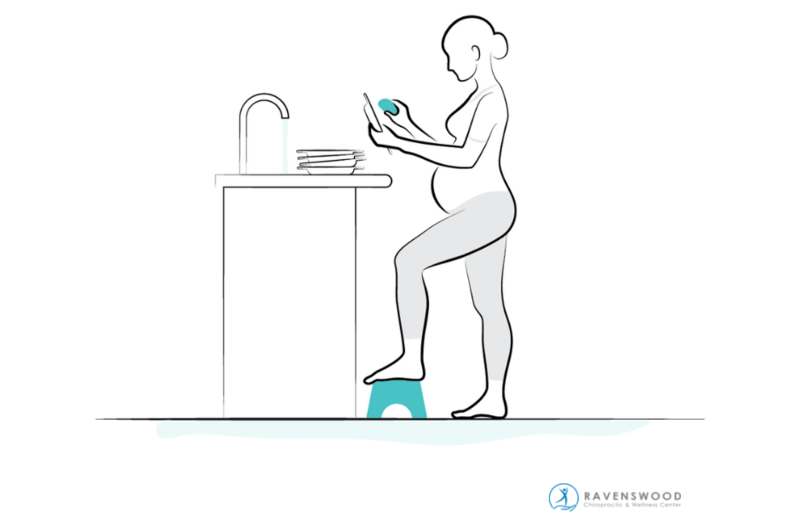 One exercise that will not be appropriate during your pregnancy is deep squatting as doing so may encourage the baby to move into a compromised position. We highly recommend making the investment in either a birth ball or a pregnancy rocker, also known as a Swedish or ergonomic chair. This is where you want to spend most of your time when sitting. You can also use a traditional dining room chair, but there is a particular way to sit in it. When you want to read or watch television, you can do so in a dining room chair but be sure to lean forward regularly. You can also sit facing backward in a dining room chair. Place a firm cushion or pillow underneath your bottom and lower back. This will help you to sit more upright. A good rule of thumb, no matter what type of seat you’re in, is to keep your tummy lower than your spine, and your knees lower than your hips. It’s safe to kneel on the floor while pregnant, but it’s essential to have support. You can lean over an Ottoman, coffee table, a stack of floor cushions, birth ball, or a bean bag. Sitting with your legs crossed can decrease the amount of space in the front part of the pelvis. This might force the baby to lie towards the back of your pelvis and enter an occipital-posterior mal-position. It’s okay to go about your regular errands, including work, but we would advise against long trips in a car that has bucket type seats. We would also not recommend placing your chair into a semi-reclining position or bringing your knees higher than hips. Doing so might cause your baby to enter the pelvis in an occipital-posterior mal-position. Whether you are in the planning stages of getting pregnant or you’re in your second or third trimester, it’s essential to keep your postural health in mind for your sake and your baby’s. Schedule a visit at Ravenswood Chiropractic to have your posture and biomechanics checked. Having your posture examined and adjusted if needed can help to alleviate unnecessary pressure, strain, and pain. 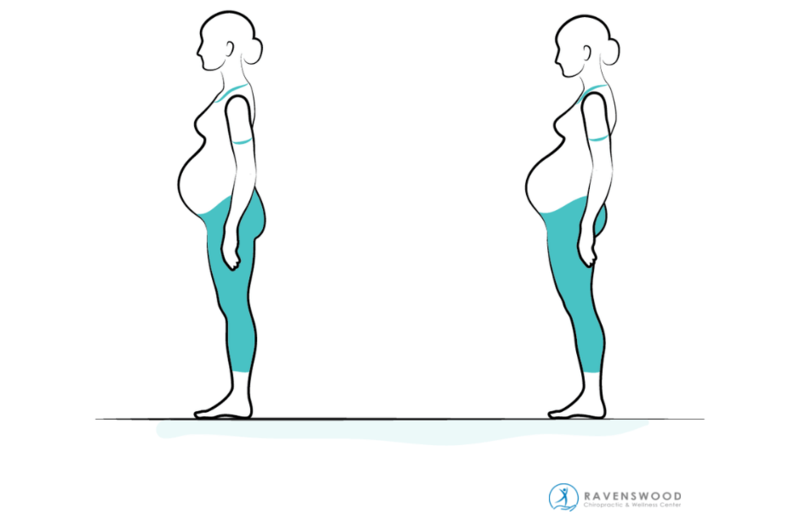 Have questions about posture during pregnancy? Speak to one of our expert team members today 773.878.7330.